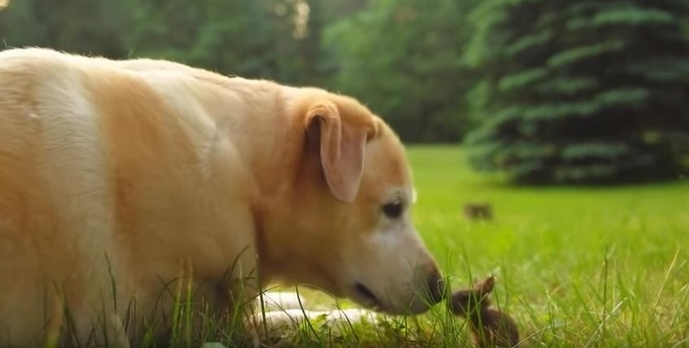 A gentle Labrador made a very unlikely friend while playing in the garden - an extremely tiny rabbit. 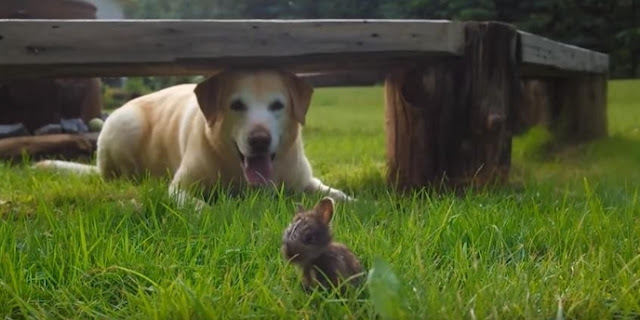 The heart-warming video was captured by the owners of dog Meg, who spotted their pet becoming acquainted with a baby bunny. In the clip the pair can be seen enjoying the mild weather of Canada while facing off with each other in the long grass. Their fun-loving boisterousness and lack of fear may require training and firm handling at times to ensure it does not get out of hand—an uncontrolled adult can be quite problematic. Females may be slightly more independent than males. Labradors mature at around three years of age; before this time they can have a significant degree of puppy-like energy, often mislabelled as being hyperactive. Because of their enthusiasm, leash-training early on is suggested to prevent pulling when full-grown. Labradors often enjoy retrieving a ball endlessly (often obsessively) and other forms of activity (such as agility, frisbee, or flyball). Responses to "Heart-warming moment Meg the Labrador playing with a wild baby rabbit "
Lol So tiny he can barely hop! Thats one hell of a back yard. Very blessed. Bunnies go out on their own at a very small size. Many just don't make it. Should let this dog be it's protector for awhile. Hope it is a male or you will have more company than expected. ha ha Still one of the cutest baby animals in North America.